Home Ear health Why Earwax is Important for Your Health? The glands inside the ear secrete earwax (cerumen). It is a mixture of fatty acids, dead skin cells, cholesterol, lysozyme, squalene, and alcohols. Such, earwax is technically not ‘wax’, but a compound made up of water-soluble secretions. Most people do not give much thought or attention to their earwax not knowing that it is one of the most ingenious protective mechanisms produced by the body. Therefore, it is unwise to preserve earwax as unhygienic; it is far from being a nuisance substance in the ear. The production of the wax in your ears is consistent therefore needs to be checked to ensure there is an appropriate amount of it in the ear canals. Excesses of the wax can lead to blockage, but this is not very common. As such, it is best not to try and remove the earwax using cotton swabs or different devices. We have just recently published an overview over the most effectve ear wax cleaning tools. Excess wax is pushed out of the ear canal due to the natural migration of skin cells. Also, the movements caused by chewing and talking that reach the ear canals also aid in the expulsion of excess earwax. The excess wax will fall out of the ear or be washed away when you bath or take a shower. The unfortunate thing is many people things that they should clean out the earwax routinely; this is mostly based on misplaced and misinformed personal hygiene beliefs. Putting anything inside the ear, be it a bobby pin or a cotton swab can result in damage to the canal, impaction of the earwax, internal trauma, or temporary deafness. The efforts to remove the wax may only push the earwax further inside the canal causing blockages. How Wet or Dry Is The Wax? How wet or dry the earwax is is a matter subject to genetics. Research shows that you either have a wet or dry wax based on your genes. • Wet earwax is brown or yellow and with a sticky texture. • Dry earwax has a light colour that ranges from tan to grey and with a crumbly texture. One particular gene determines the type of earwax a person has, and this is subject to the individual’s family background. Wet earwax is common in Europeans and Africans while dry earwax is mostly in people from East Asia. The gene responsible for dry earwax is also associated with the low production of underarm odour amongst Asians, namely the Japanese, Chinese and Koreans. Interestingly, the earwax from Caucasians has more odorous compounds that a believed can even help detect diseases; this is according to research that measured the concentration of twelve volatile compounds in the wax from white men compared against that of men from East Asia. Earwax is a sticky substance created by glands, located in the ear canal. Even though many researchers still don’t agree to all the reasons behind earwax, it is commonly accepted that it prevents dust or other little particles from getting to the eardrum. In that sense, earwax acts as a natural protector from those particles as they could harm or contaminate your eardrum. Usually, the dirt, trapped in the earwax falls out with the wax itself when it dries up and falls out of the ear. We all produce earwax, however, the quantity and type of it is genetically predispositioned just like eye color or height. Ear canals of smaller shape may make it troublesome for the earwax to escape the canal, which could lead to health complications. Blockage, or impaction, likewise happens when the wax gets pushed too far into the ear canal. Earwax blockage is a standout amongst the most widely recognized ear issues known by specialists. The most occurring reason for blockage is the utilization of cotton swaps(along with similar objects), which removes wax on the surface yet it pushes whatever remains of the wax further into the ear canal. Hearing device and earplug consumers are additionally more inclined to earwax blockage. If you have any of the above-mentioned symptoms of earwax blockage, you should consult with your doctor. There are other health issues that cause the same symptoms, so make sure the earwax is the reason behind your problems before you try to treat yourself with homemade remedies. You should visit the hospital if you experience a severe spinning sensation that could include the loss of balance or even inability to walk properly. Other symptoms you should take seriously include persistent vomiting, high fever and a sudden loss of hearing. If you experience any of those symptoms, you should not hesitate to visit the nearest hospital. Specialists usually diagnose patients by listening to their description of the symptoms and then by checking the ear with an otoscope (ear-scope). The earwax can be removed with a small plastic spoon (curette) or by using warm water, sodium bicarbonate or another type of eardrops. 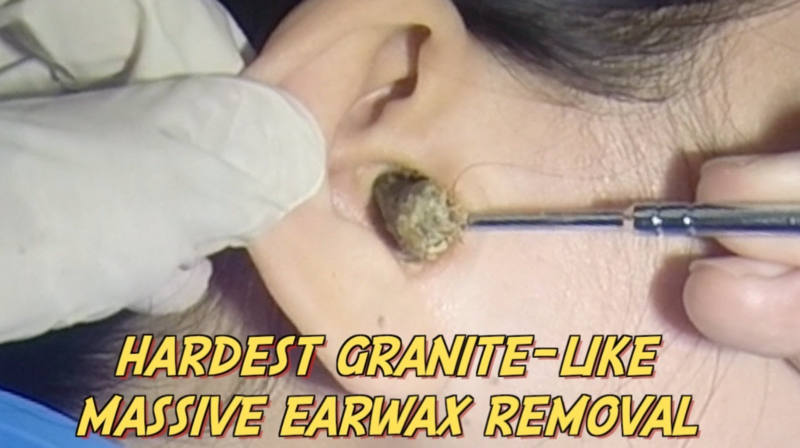 A gentle suction can also be used to remove the earwax. Over-the-counter wax softening liquids could be placed into the affected ear while keeping your head to the side and then drained out along with your earwax by putting your head to a natural position. A syringe might be utilized to clean the ear with warm water. The water ought to be at body temperature in order to avert dazedness. Ear candling isn’t suggested. The technique utilizes an empty cone made of paraffin and beeswax with material on the end. The decreased end is put inside the ear, and a collaborator lights the opposite end while ensuring your hair does not burst into flames. In principle, as the fire starts, a vacuum is created, which pulls the wax out of the ear. Despite that, the clinical experiments demonstrated that no vacuum is actually made, and no wax was removed in that process. Besides, this technique could result in serious injury. Earwax implication can be prevented by refraining from the use of cotton swabs or other items that shove the wax further into your ear canal. Wet earwax is brown or yellow and with a sticky texture. Dry earwax has a light colour that ranges from tan to grey and with a crumbly texture. If you are not living under a rock you have probably heard that cotton swabs are making more damage then good to your ears. There are many different tools on the market right now which are doing a much better job than cotton swabs. One of the is for sure the Wax Rx tool which is the tool that doctors are mostly using to clean ears. The second product which is selling most is the elephant ear washer tool, which is cleaning your ear under water pressure. You can read more about those product and a detailed description inside our review section. Next articleWhy do fax machines still exist?